"Bert’s Motor Home Park" opened in the mid 1960s and has grown up over the years into a 99-site, resident-owned, manufactured home community. But that transition didn't happen overnight. We began the move toward controlling our own destiny in 2011. That's when, with the help of Cooperative Development Institute and ROC USA, LLC, we formed Milton Mobile Home Cooperative that would, on February 7, 2012, purchase and take control of our community. 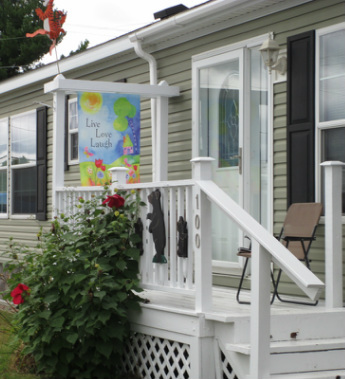 Now, the Milton Mobile Home Cooperative is not only a successful business, but also a thriving neighborhood. The process of the cooperative buying the land beneath our homes brought this community closer together. Not only do we know far more of our neighbors than ever before, but we look out for one another, too. And with no outside landlord to report to, we're the envy of other nearby manufactured home communities. Our member households elect our board of directors, which works with a property management firm and also appoints various volunteer committees to help with special projects, celebrations, community improvements and more. The board submits a budget every year, and the entire membership votes on it and any changes to the rent before the budget becomes official. We're running the multi-million dollar business that is our community, on our terms, by our rules, for the betterment of ourselves and our neighbors. Milton Mobile Home Cooperative couldn't be better situated. It’s a peaceful low-traffic family community that has a small-town feel. Our developing neighborhood community is surrounded by beautiful winding roads, but is still close enough to the city of Burlington – only 25 minutes away – for access to just about anything you need. Burlington offers an airport, shopping centers and university classes for anyone who might be interested. Our local taxi service can take you from Milton to Burlington which is known for its art, culture and educational institutions. Milton has all the basic necessities covered, with grocery stores, pizzerias, banks, gas stations and churches, most things you need are very accessible. Since we voted to become a resident-owned community in 2011, we have worked hard to improve our community. We've put up new mailboxes, made road repairs, upgraded our water system and more. With our small-town feel, you can know your neighbors and still enjoy your privacy. Ask anyone who lives in Milton Mobile Home Cooperative, and we're sure they'll tell you it's a little slice of heaven.